UAE master developer Nakheel is heading back to Britain to showcase a plethora of real estate projects - collectively worth Dh58 billion ($15.7 billion) - at the Dubai Property Show at London Olympia. Nakheel, a platinum sponsor and the biggest developer at the event, will highlight Dubai’s real estate investment opportunities through a host of projects - offering everything from luxury living and leisure to stylish, functional accommodation - at prime locations across Dubai, including the world-famous, award winning Palm Jumeirah. More than 29,000 British citizens have invested Dh88 billion into Dubai property, according to the Dubai Land Department, with Nakheel’s own customer portfolio including 2,530 Britons who have spent Dh5 billion on its properties. Nakheel had exhibited at the inaugural DPS London event in 2016, and is now back two years later for the second event with a new and exciting range of projects and attractive payment schemes, including low deposits, post-handover payments plans of up to seven years and five years’ free service charges for units with starting prices at Dh449,000. 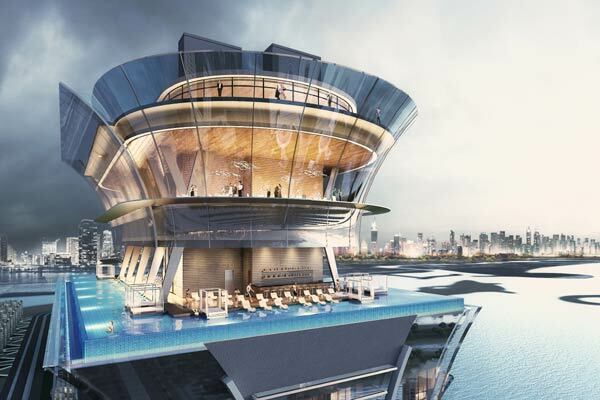 •Luxury apartments in The Palm Tower on Palm Jumeirah - Home to one of the world’s highest rooftop infinity pools and a viewing deck offering sweeping vistas across The Palm, Arabian Gulf and Dubai skyline. Prices start from Dh1.65 million for units which are due for completion by end of 2019. •High-end units at Azure Residences, also on Palm Jumeirah, offering beachfront living, a seafront infinity pool and a range of onsite restaurants. Prices for these ready-to-move-in units start from Dh2.5 million onwards. •Stylish high-rise units at the newly-launched Dragon Towers, directly connected to the world-famous Dragon Mart mall at the rapidly-growing Dragon City mixed-use community. Prices start from Dh449,000 for units which are due for completion in 2021. Also on display will be the terraced homes, each with a private pool, at the upmarket Jumeirah Park community, offering four bedrooms, garage and maid’s room and within walking distance of a school, shops and recreational facilities, said the developer. Prices start from Dh3 million for units which are due for completion by 2021, it added. Chief Commercial Officer Aqil Kazim said: "The Dubai Property Show is a golden opportunity to showcase our projects to an audience that is already our third largest group of investors outside the Middle East." "We are proud to be back as Platinum Sponsor to represent Dubai and all it has to offer. The city’s world-famous projects and enviable lifestyle are already well-known among UK citizens, with many calling it their second home, but we are boosting British investment and strengthening Dubai’s relationship with this part of the world even more through this show and other initiatives," remarked Kazim.